April 21, 2015 is an important date. That’s the day when Google will begin using mobile friendliness as a ranking signal. There’s been a lot of talk about how that’s actually going to work, how much of an impact it will have, etc. Well, more and more information has been surfacing over the past few days about the changes. For example, Gary Illyes spoke at SMX West heavily about the new mobile UX algo and provided some outstanding information. Jennifer Slegg wrote up a recap of that session, which I highly recommend reading. She provided some amazing nuggets of information, including information about mobile friendly techniques, how the algo will handle specific urls, if 4/21 is hard date for the rollout, if Google is building a mobile index (which they are), and more. So, as 4/21 quickly approaches, many webmasters are working hard to get their sites in order from a mobile UX standpoint. As documented by John Mueller and Gary Illyes (and really Google itself), you can use any of the three options for providing a mobile-friendly version of your website. For example, you can use responsive design, dynamic delivery, or even a separate mobile site. I’ve seen all three techniques work well for clients, so the path you choose should be based on your own site and business. But definitely move quickly… April 21 will roll up quickly. Many people don’t realize this, but Google already has a smartphone rankings demotion in place for specific situations. For example, when there are faulty redirects from the desktop version of the content to the mobile version, or if there are other mobile-only errors. I caught one of those situations in the wild and wrote a two-part case study about it. I first detailed the problems I saw on Electronista.com and then documented the improvements in rankings and traffic once the problems were fixed. Based on what Gary Illyes and John Mueller have both said about the mobile UX algo, it sounds like the new algorithm will work in a very similar fashion to the current smartphone rankings demotion. Therefore, I definitely recommend you review the two-part case study. For example, the current smartphone rankings demotion is on a url by url basis. Just because you have faulty redirects or mobile-only errors does not mean the entire domain should suffer (algorithmically). Also, the desktop urls are unaffected (which makes absolute sense). Also, and this is important, the algorithm is running in real-time and will impact urls during the normal crawling process. That means urls can be demoted as Google comes across mobile problems, but the demotion can also be lifted as Google crawls the urls and notices that the problems are fixed. And that’s exactly what I saw with the smartphone rankings demotion situations I have helped with. 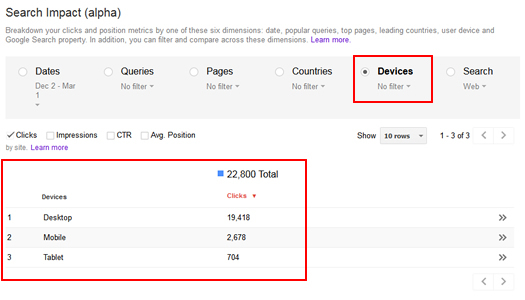 Google is currently testing a new search queries report in Google Webmaster Tools (called the Search Analytics report). Note, the report used to be called “Search Impact”, but was changed during the alpha. I have been testing the new version of the Search Analytics reporting and it provides some great functionality beyond what the current Search Queries reporting provides. I plan to write more about that soon, but for now, let’s focus on the mobile friendliness algorithm rolling out on 4/21. But don’t get fooled by the simplicity of the default report. By combining dimensions, you can view some elaborate reports that tell you a lot in a short amount of time. When working on a smartphone rankings demotion (the current algo in place), I had to identify queries where a site ranked well in the desktop results, and then jump to the search queries reporting using the “mobile” filter for search property. When doing this for a large amount of queries, it could easily get monotonous. 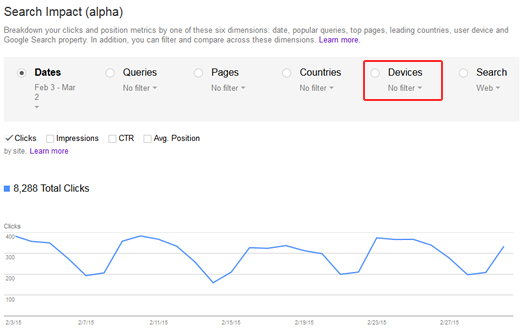 But the new Search Analytics report comes to the rescue and provides a nifty way to see side by side rankings when comparing desktop to mobile. Below, I’m going to show you how to quickly run this report to see a side by side comparison of clicks and average position by query. By doing so, you can quickly identify a smartphone rankings demotion. That’s for the current smartphone rankings demotion, and should work for the new mobile UX algo rolling out on 4/21/15. Let’s jump into the report. 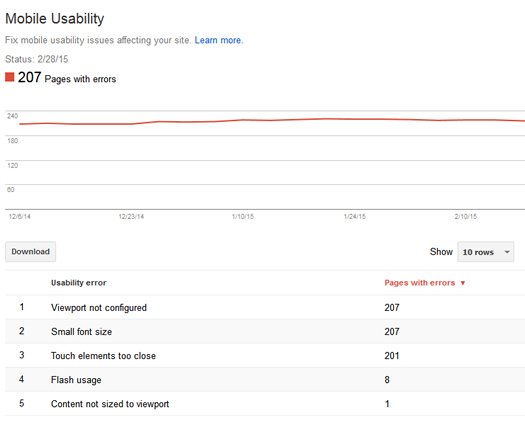 First, if you’re not part of the alpha testing program, then you won’t be able to access the Search Analytics report. But don’t fear, I can only imagine that Google wants to roll it out prior to 4/21/15 (based on the device reporting I’m showing you in this post). The default view will show you clicks for the past 30 days. The first thing you need to do is click the “Queries” dimension. 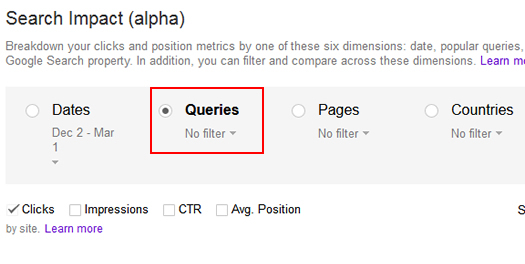 That will present all of the queries your site ranks for during the timeframe you selected. Next, click the filter dropdown underneath “Devices”, which should say “No filter” (since there isn’t a filter in place yet). 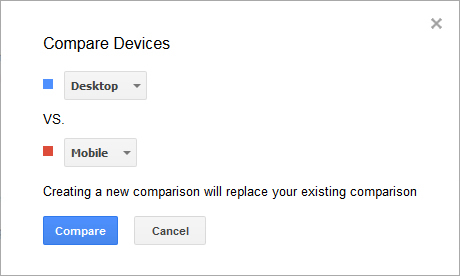 Click the dropdown and the select “Compare devices”. Keep “Desktop VS. Mobile” as the selection and then click “Compare”. 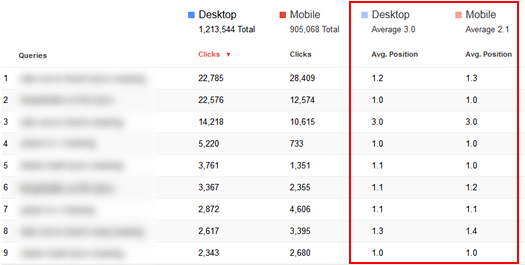 You should now see a comparison of clicks per query for both desktop and mobile. That’s great, but we need to know how the site ranks for each query across both desktop and mobile. To see that, click the checkbox for the “Avg. Position” metric. 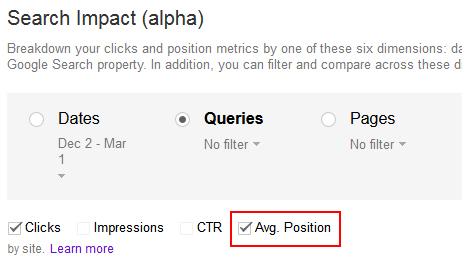 This will add average position for each query to the report. To view more queries than the default ten, you can use the dropdown at the top of the report. 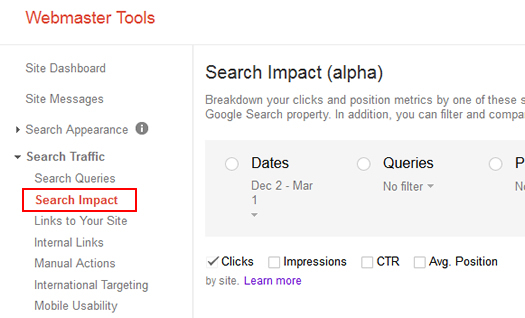 For example, you can show up to 500 rows in the report in Google Webmaster Tools. Now you can start checking rankings for queries across both desktop and mobile. Don’t expect them to be exactly the same for every query… But they should be close. For example, the first three listed below are very close (two are identical and one is off by just .1). In my experience, when you have a smartphone rankings demotion, there will be a clear difference. For example, some smartphone rankings will be 10+ positions lower (or even non-existent in certain situations). So, if you see rows like the following, then you might have a problem. If you find that there is a smartphone rankings demotion in place, then you should run to the “Mobile Usability” reporting in Google Webmaster Tools. Google will provide the problems it encountered while crawling your site. I highly recommend fixing those mobile usability issues asap. 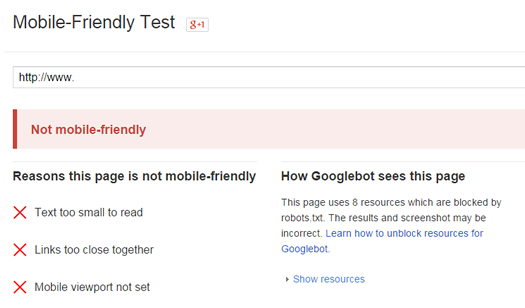 You can also use the mobile friendly test via the Google Developers site. 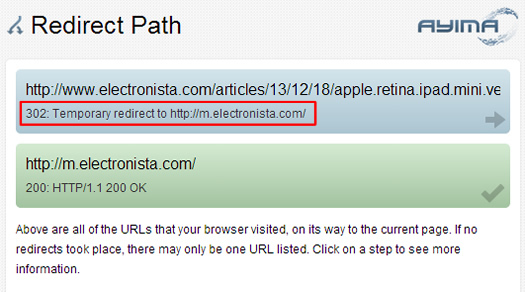 That will also highlight problems on a url by url basis. 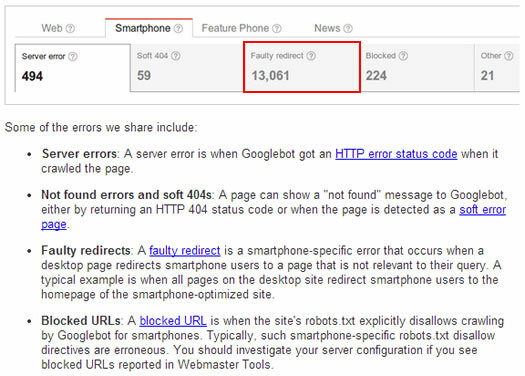 You can also check the crawl errors reporting in Google Webmaster Tools to see if there are smartphone errors or faulty redirects. And you can crawl your site as Googlebot for Smartphones to check how your site is handling requests for the desktop pages (if you have mobile redirects in place). Doing so can surface problems sitting below the surface that are sometimes hard to pick up manually. We all knew that mobile UX would become a ranking signal at some point, but now we have a specific date from Google for the rollout (4/21/15). When the new mobile algo launches, many will be wondering if they have been impacted, if their website dropped in rankings, and which urls are causing problems. As I demonstrated above, the new Search Analytics reporting can help webmasters quickly identify problems by comparing the rankings across desktop and mobile (quickly and efficiently). If you don’t have access to the Search Analytics reporting yet, don’t worry. Again, I believe Google is going to roll this out before the 4/21 deadline. That would make complete sense, since the “Devices” dimension could prove to be extremely helpful when a smartphone rankings demotion is in place. One thing is for sure. The changes rolling out on (or around) April 21 will be fascinating to analyze. Google said this change will have a “significant impact” on the smartphone search results. And that impact can translate into many lost visitors, conversions, and revenue. Good luck.